Gardeners, I’m talking to you here. Any gardener worth their mulch knows what gifts to give another gardener. And you also know it’s really, really hard to tell non-gardeners what to get for you. Say “I could use bypass secateurs with gear action to trim the hydrangeas,” and you may well be met with a blank stare. To tide you over the bleak mid-winter, look for beautifully designed succulent dish gardens that would be charming indoors in bright light. Bonus: Succulents and cactus are very forgiving plants. You can forget to water them for months, and they’ll bounce back, maybe not quite as good as new, but they will recover nicely. If you’re ambitious – and enjoy that kind of thing – pick out plants, dish and soil and put together your mini-desert garden yourself. Add some pretty stones and even a dinosaur or two if you want to personalize it. I am not a minimalist, but cactus and other succulents in chaste white containers are popping up at many craft markets these days, too. They’ll bring a bit of nature into the house without all the mess that usually goes along with it. Something else to treat yourself to at this time of year is indoor garden supplies. If you get the urge to repot any of your little green pals over the months ahead, it’s a pain in the aspidistra to have to run around searching for pots, tools and soil. So stock up now or, like a squirrel, stash some of your outdoor supplies in the basement or on the porch. Something to water small indoor plants with. 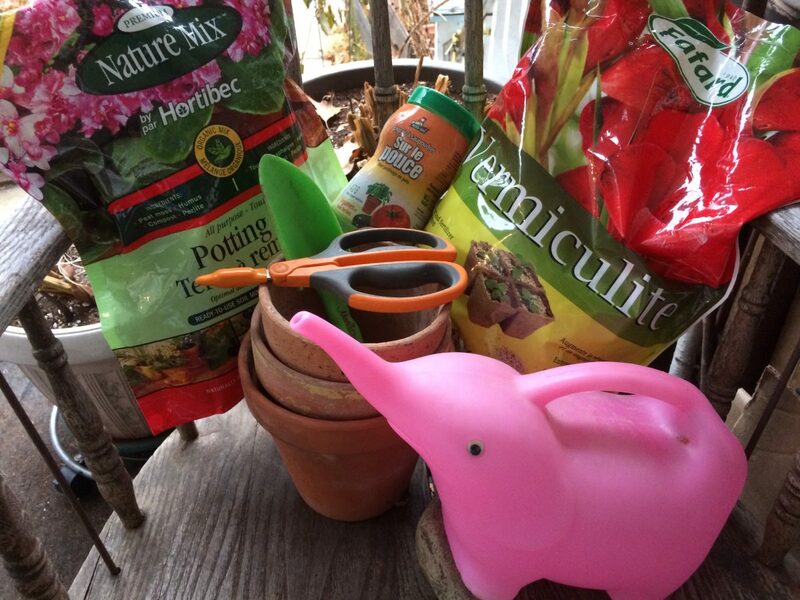 A 2 L watering can with a long neck is my favourite, but I also find an ordinary water bottle handy for tiny plants. Lucky you, if you have an enclosed porch or heated garage to use as a winter garden shed. A basement will do, too, though there’ll be a certain amount of schlepping materials and plants up and down the stairs. On Very Nice Days, you can shift your work outside, but remember, indoor plants are tender and don’t appreciate sudden dramatic temperature changes. I’m starved for garden action during the cold months, so, yes, I do all this stuff. It makes me happy. I can smell soil and green things inside. It’s an escape from thinking about bills, making dinner, doctors’ appointments or home repairs for a brief while. And it’s a whole lot cheaper than taking a winter vacation. Whether you celebrate Christmas, Chanukah, Kwanza or some other holiday, have a joyous and hope-filled time.